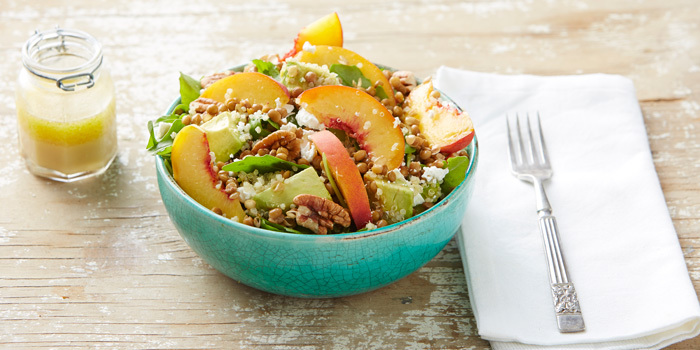 A fresh fruity salad such as this Lentil, Quinoa and Peach Salad will keep you happy on those warm summer days. 1 yellow peach, stone removed, cut into 8 wedges. 1 cup Cooked Quinoa, defrosted. 1 cup Cooked Lentils, defrosted. 1 small avocado, cut into cubes. 1. Combine all salad ingredients in a large salad bowl. 2. To make dressing, whisk ingredients in a small bowl or jar until well combined. 3. Serve half the salad for dinner drizzled with half of the dressing. Place remaining salad and dressing in the fridge for lunch tomorrow. If peaches aren't in season where you live, replace with a small green pear or a small Lebanese cucumber.